Children as young as five and several octogenarians have done it. 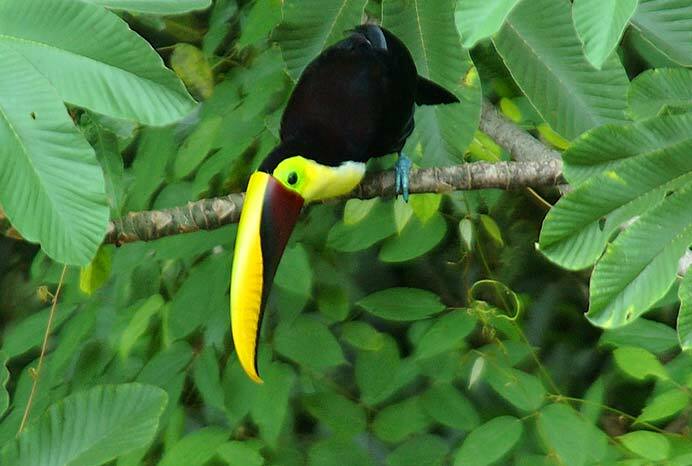 Your Zip line Tour – Flight of the Toucan, imitates the flight of the chestnut-mandibled toucan, as it leaps off a branch, swoops down through the forest and then up into another tree. On this tour, 8 separate cable rides take you from one ridge top to another, across valleys and streams. There are 14 land-based platforms and 1 tree platform with a view of the coast. 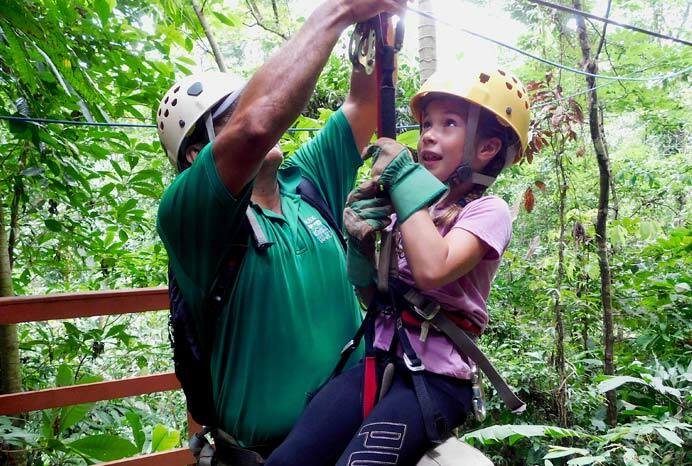 The Flight of the Toucan zip line tour is a rainforest experience and a canopy adventure, suitable for the whole family. 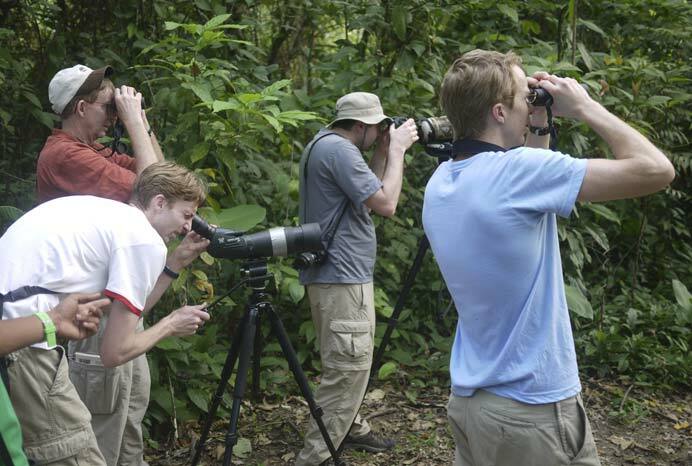 Most of the groups see wildlife and birds such as monkeys, sloths, and toucans. 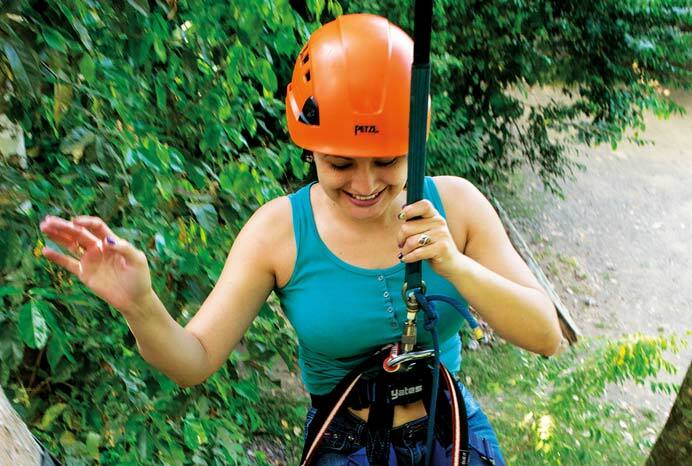 A great way to see and learn about the tropical rainforest and have fun at the same time. Times: 8 AM / 11 AM / 2 PM, Every day of the week. Size Limit: Approximately 118 kg (260 lbs.) and the guest must fit comfortably in our XL harness. Most people with a 42” waist or less will fit. Limit: Minimum 2 people, Maximum 12 people at one time. What to bring: Long Shorts, T-Shirt (preferably with sleeves), Hiking Shoes or Tennis Shoes, Camera, Water Bottle, and Bug Spray. 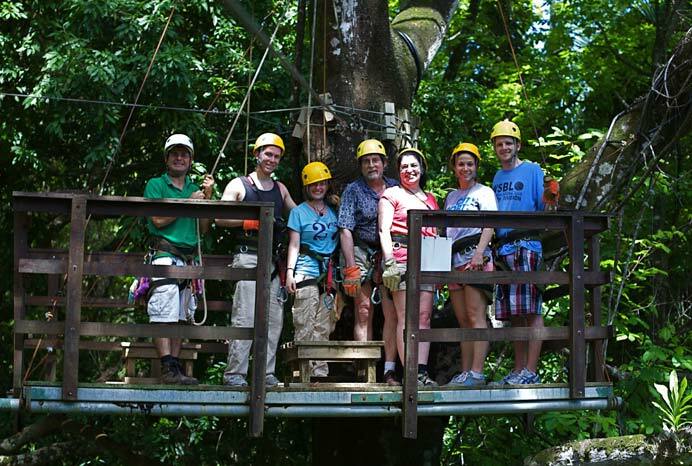 What’s included: Naturalist Guide, Zip Line Tour, Admission Fee to Hacienda Barú National Wildlife Refuge, Bird Watching Tower, and the Medicinal Plant Garden. *Ask us about the long version of this tour. 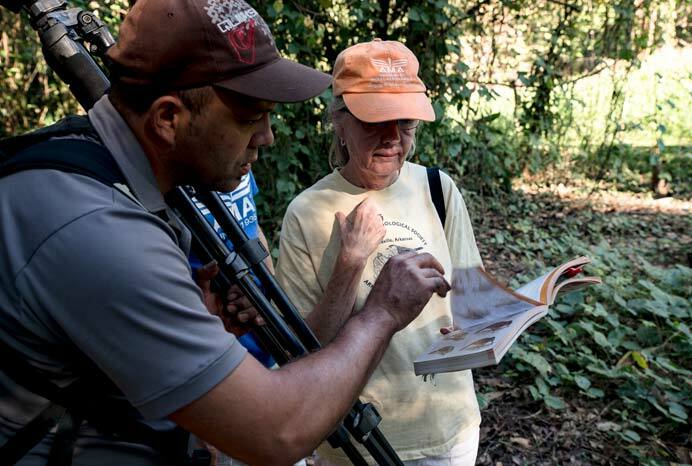 After a cup of coffee, your guide will take you on the lowland trails. 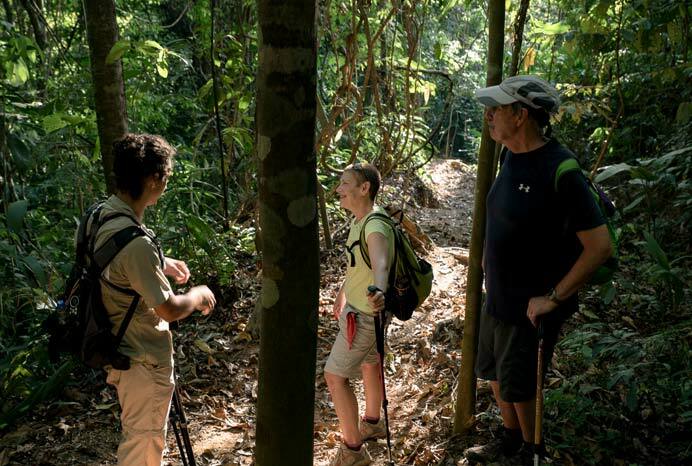 Your experienced local Naturalist Guide will lead you first down sparsely wooded trail through a former teak plantation where myriad birds are found in the trees and the brush. This trail leads you to a creek, where egrets, herons, rails, and ibis are often found. The creek meanders in secondary forest until you hit a rural road to the beach, where you will have best opportunities to observe shore birds such as whimbrels, plovers, phalaropes, sandpipers and sanderlings, pelicans and frigate birds. From the beach it is a short walk back to the Guide Center, where you began. *If you would like to have breakfast upon returning to the lodge, it’s available at additional cost. Times: 6:00 AM, Monday – Saturday. What to bring: Hiking Shoes or Tennis Shoes, Binoculars, Sunblock, Hat, Camera, Water Bottle, and Bug Spray. 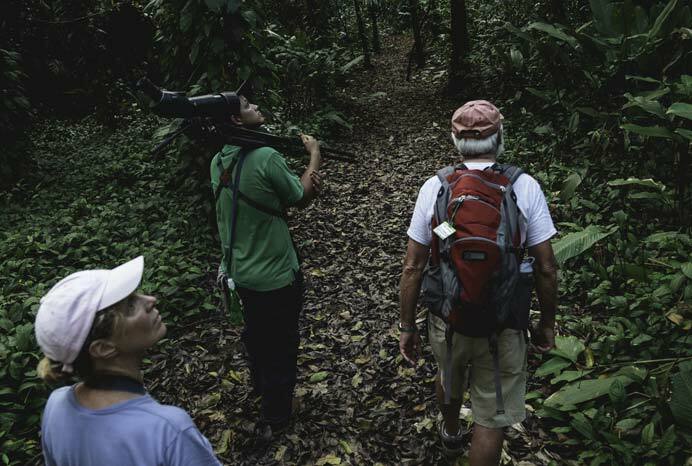 As in the long version of this tour you begin by walking through old cacao plantations and from there work your way up into the primary rainforest. It takes advantage of the early morning hours when the birds are most active. 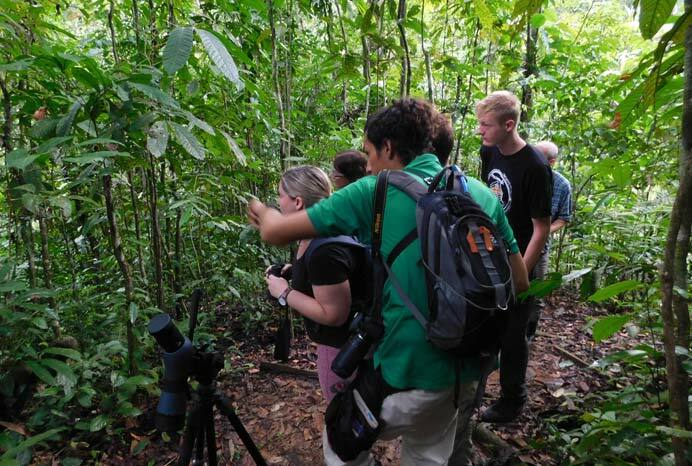 Your birdwatching tour begins just after daybreak with your Naturalist Guide and a cup of coffee in the Hacienda Baru Lodge gardens where hawks, tanagers, toucans and flycatchers abound. When you’re ready, he’ll take you through a stand of old cacao plantations, where the Monkeys are Made of Chocolate story begins. 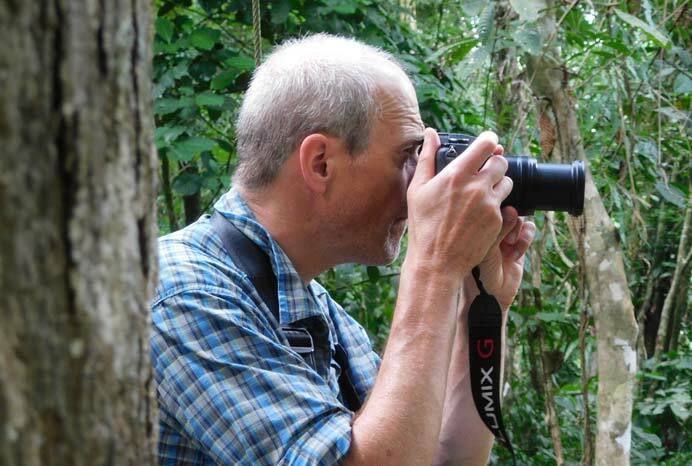 The forest provides unlimited hiding places, and birding here is definitely hard work. 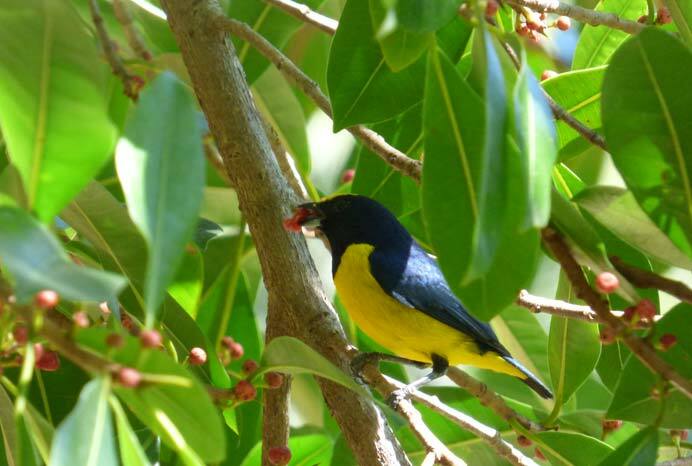 With a little luck, you will be rewarded with sightings of some of the more elusive birds such as: trogons, motmots, antshrikes, manakins, tinamous, curasows and others. * More than just a simple collection of essays, Monkeys are Made of Chocolate, by Jack Ewing founder and manager of Hacienda Baru Lodge & Tours, is a testament to the wonder of life in all its countless guises, as seen through the eyes of a man with a gift for subtle discernment and a natural flair for storytelling. 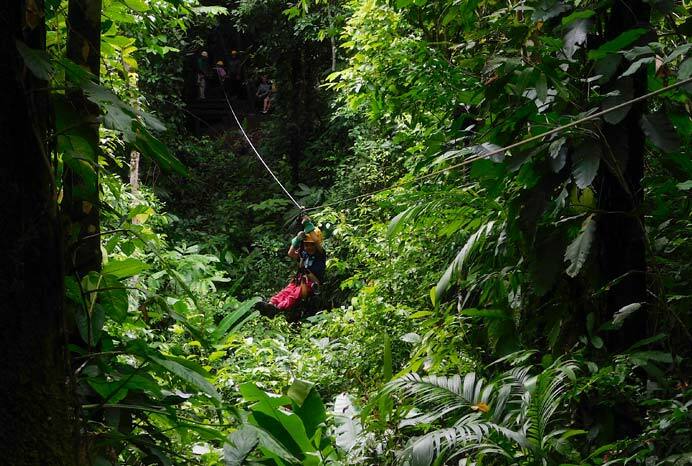 Discover the mysterious and fascinating ways in which animals and plants—and people—interact with one another in the rainforests of Costa Rica. 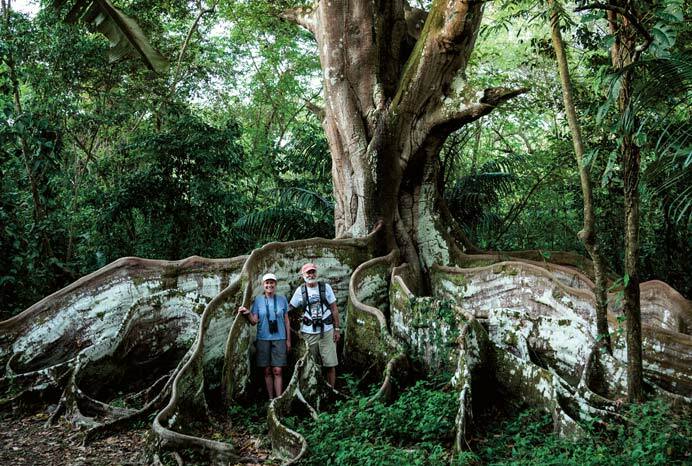 Author and naturalist Jack Ewing shares a wealth of observations and experiences, gathered from more than four decades of living in southwestern Costa Rica, home to some of the most prolific and diverse ecosystems on Earth. 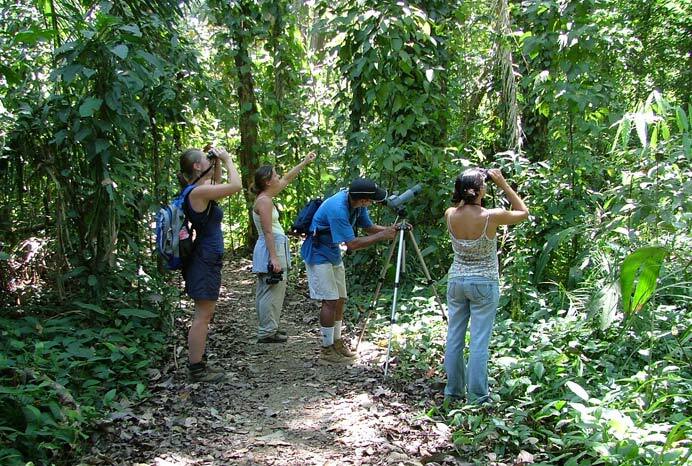 An ideal location for spotting tanagers, honeycreepers, toucans, saltators, vireos and more. After a cup of coffee, we will take you by car to the Hacienda Barú Biological Research Center a couple of kilometers away. From there you will hike through secondary forest with your sharp-eyed guide. 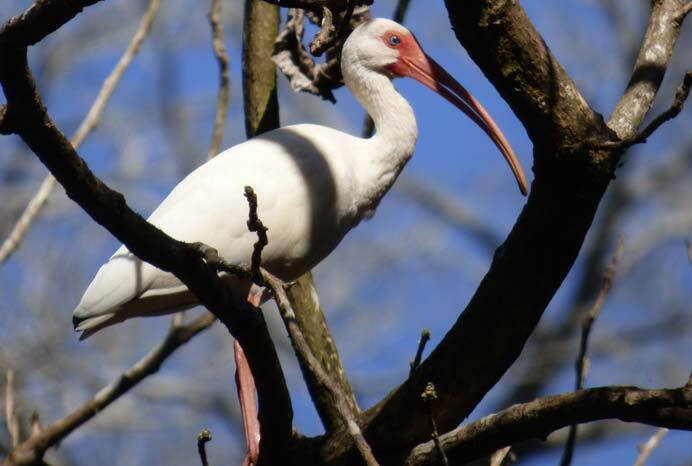 After about an hour you will arrive at rookery where egrets, herons and ibis are often found. From the rookery you will continue along the edge of the mangrove and complete the loop back to the Biological Research Center. 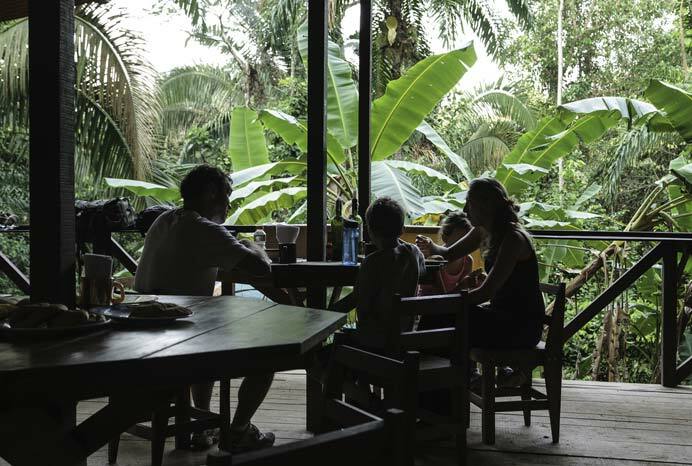 You will have a typical Costa Rican breakfast at the Biological Research Center. The final leg of the tour includes secondary forest and the beach, your best opportunities to observe shore birds such as whimbrels, plovers, phalaropes, sandpipers and sanderlings, pelicans and frigate birds. From the beach it is a short walk back to the Guide Center, where you began. What’s included: Guide, Naturalist Guide, Admission Fee to Hacienda Barú National Wildlife Refuge, Bird Watching Tower, Breakfast, and the Medicinal Plant Garden. 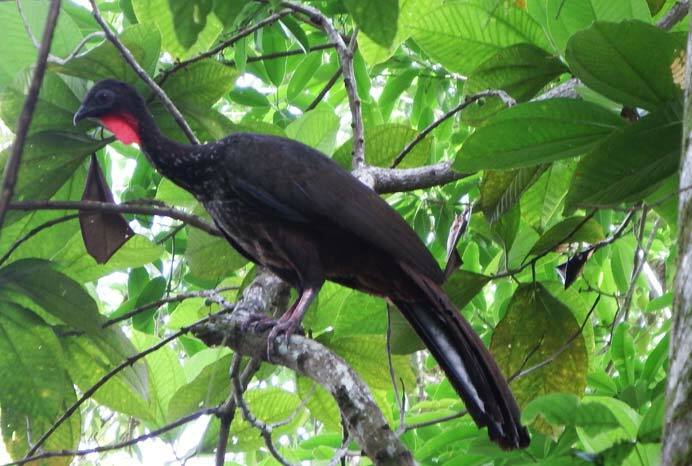 Birdwatching begins with your Naturalist Guide, he’ll take you through old cacao plantations, where the Monkeys are Made of Chocolate story begins, and you’ll end on the ridge overlooking the lowlands and the Pacific Ocean beyond. Your birdwatching tour begins just after daybreak. 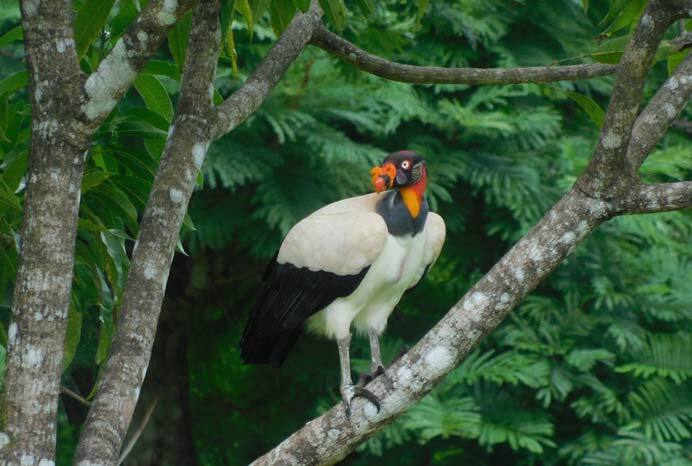 After a couple of hours of early morning jungle and its birds, you will arrive at the Hacienda Barú Campsite where you may continue to look for birds at your leisure or take off your boots and bird from a hammock while your guide heats up and serves a typical Costa Rican breakfast. After breakfast you will hike through primary forest in search for the birds that forage in this habitat. 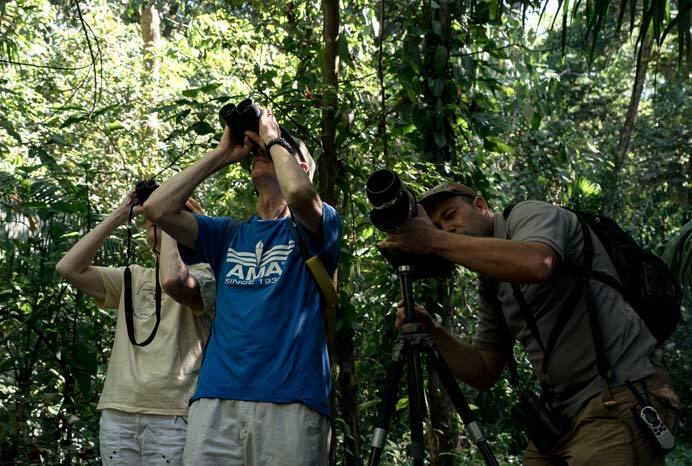 The dense forest provides unlimited hiding places, and birding here is definitely hard work. 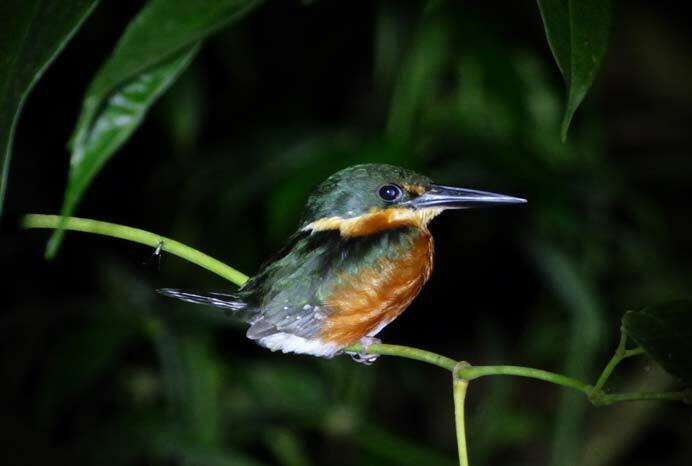 With a little luck, you will be rewarded with sightings of some of the more elusive birds such as: trogons, motmots, antshrikes, manakins, tinamous, curasows and others. From the campsite you will bird all the way back to the guide center where your tour began. Limit: Minimum 2 people, Maximum 8 people. 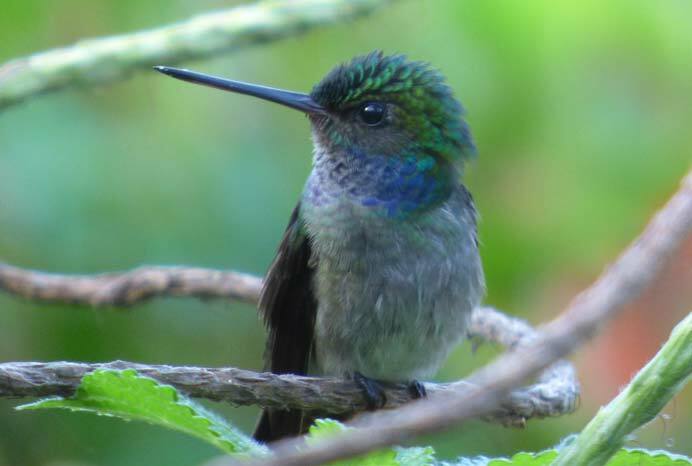 What’s included: : Guide, Admission Fee to Hacienda Barú National Wildlife Refuge, Bird Watching Tower, Breakfast, and the Medicinal Plant Garden. 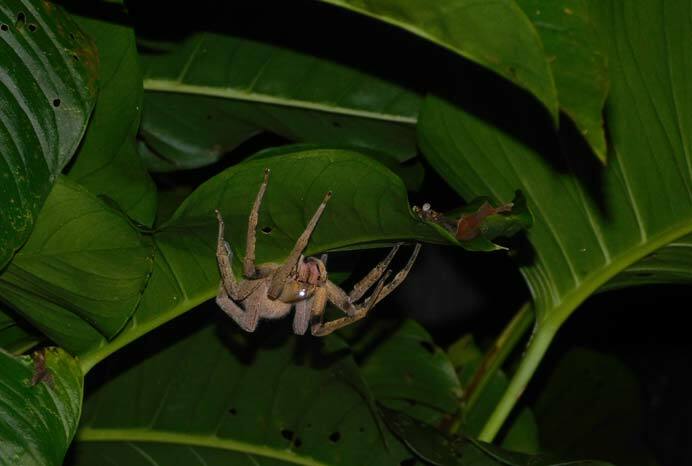 Bugs, Spiders, Frogs, Snakes, and Caimans! 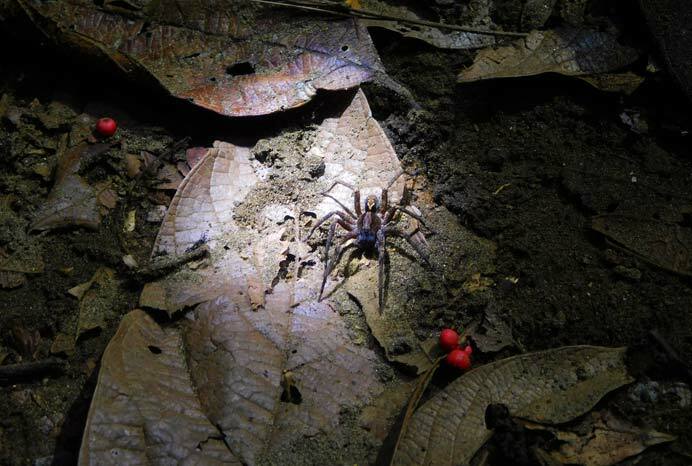 Have you ever wondered what happens in the jungle after the sun goes down?. Your night hike begins just before dark at the Hacienda Baru reception. Experiencing a trail at night is completely different than during the day. 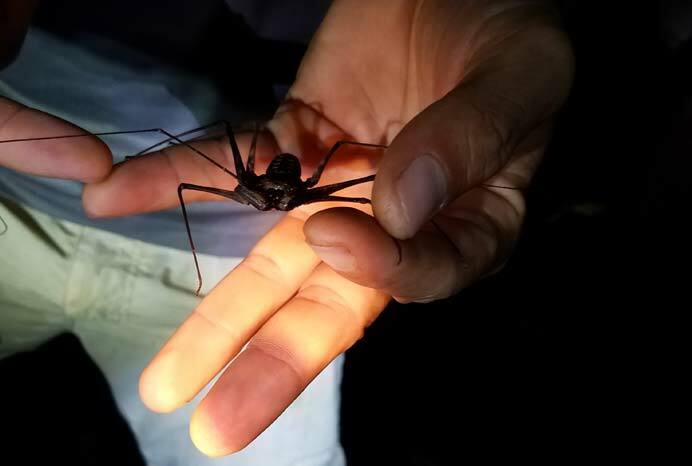 Your local Naturalist Guide will begin the tour in the gardens around the lodge where you will begin discovering the world of tropical insects and arachnids. Your next stop is a lightly wooded area where there are often frogs in natural ponds, owls and night jars may be out hunting. 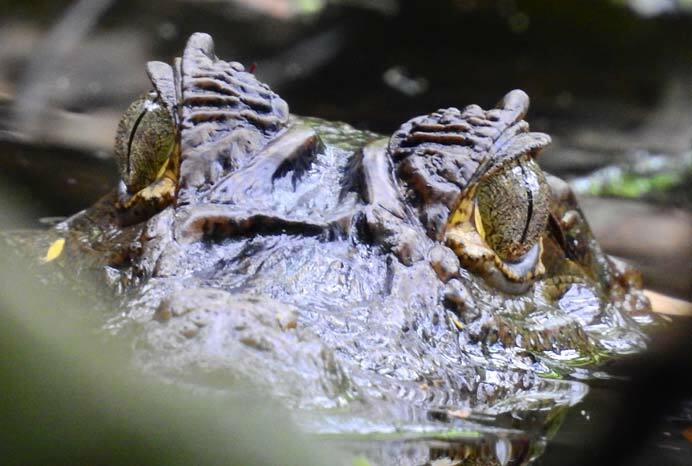 Next, hike along a waterway where your guide will look for caimans, tree frogs, owls, kinkajou, and if you’re up for it, even snakes. If reptiles and amphibians are exciting for you, you’ll be delighted with the number of species that can be seen. 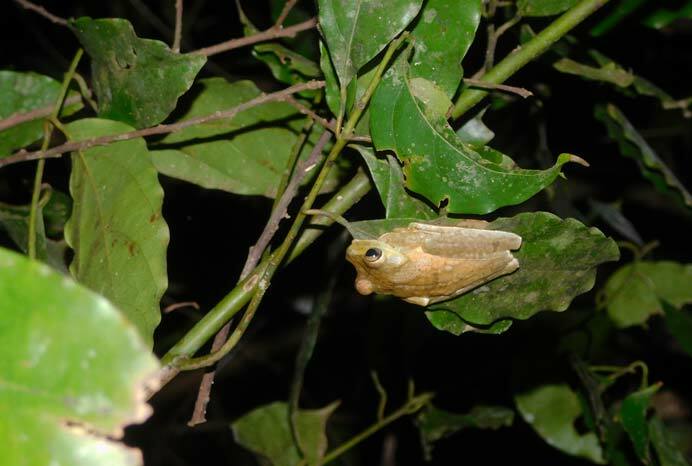 They are especially numerous during the rainy season (May-November). End up back at the Hacienda Baru restaurant where a refreshment is on the house. Rain is a strong possibility for this hike, so be prepared. Times: 5:30 – 6:00 PM, Monday – Friday. Limit: Minimum 2 persons, Maximum 12 people. 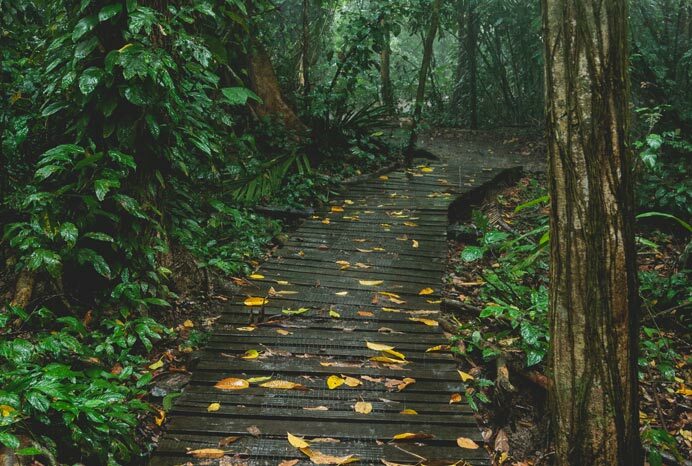 What to bring: Hiking or Tennis Shoes, A Good Flashlight (Let Us Know If You Don’t Have One), Water Bottle, Bug Spray and Rain Gear during the Rainy Season. Your local Naturalist Guide is your host. 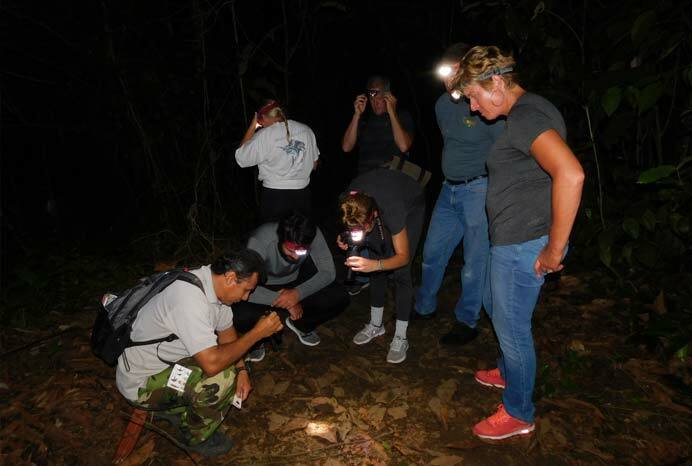 The Night in the Jungle Tour takes you deep into the jungles of Hacienda Barú, where you will begin to discover the world of tropical insects and arachnids. After the hike up to the camp, you can sit and relax on the verandah as the sun goes down and listen to the sounds of the jungle as the daytime animals and birds settle for the night and the nocturnal ones come to life. There will be no-one else for miles around, you will be in the heart of the refuge. Your Naturalist Guide will prepare a traditional Costa Rican charcoal broiled dinner. After dinner, you can stay at the camp and catch up on your star gazing from a hammock or venture out on a night hike with your Naturalist Guide. 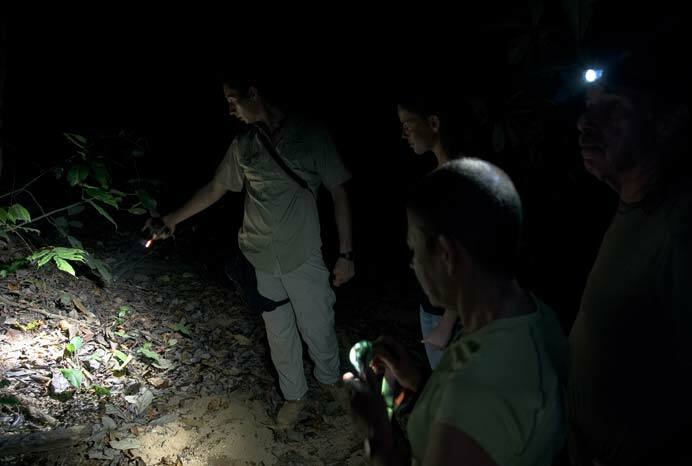 Your guide will look for poison dart frogs, tree frogs, owls, tarantulas, kinkajou and if you’re up for it, even snakes. You’ll wake up to the sounds of birds foraging in the trees that surround your tent. We promise the coffee will already be brewing. 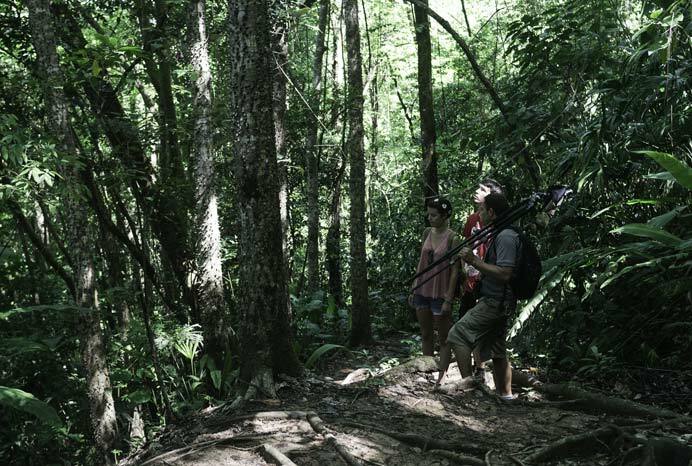 After breakfast, hike to the base of some 165 foot or 50 meter rainforest trees, and then make your way back down to reception at around 10 AM. Times: 3:00 PM, Monday – Saturday. What to bring: PJ’s, Hiking Shoes or Tennis Shoes, Binoculars, Flashlight or Headlamp, a Change of Clothes (you’ll want to shower and change after hiking up to the camp), Medication and Personal Items, Hat, Camera, Water, and Bug Spray. What’s included: Guide, Admission Fee to The Hacienda Barú National Wildlife Refuge, Bird Watching Tower, Medicinal Plant Garden, and Dinner & Breakfast. Tents: Permanent 3 x 3 meter tents with mesh sides and wooden floors. They are equipped with single or double beds depending on your group. Tents are large enough for a family of four. Your bed will be completely made up, towels are provided. The camp is equipped with a one cold water shower and two flush toilets that all participants share. 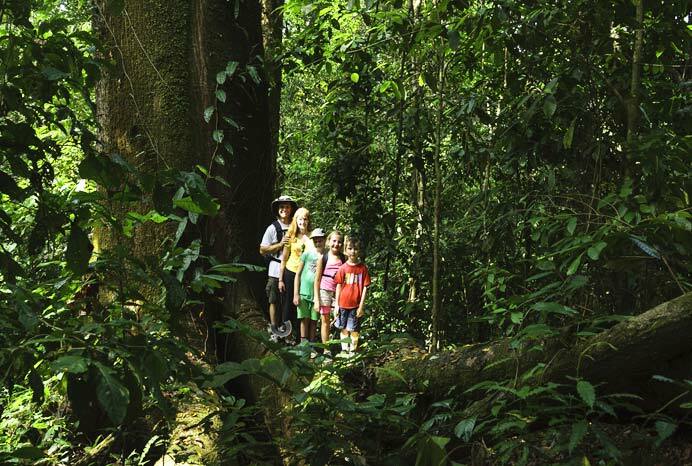 Your Rainforest Experience is a four-hour hike with a local Naturalist Guide. You’ll have time to track wildlife you spot on the way. Then continue hiking the ridges and creek beds of the refuge. There is life everywhere you turn in the mangroves. 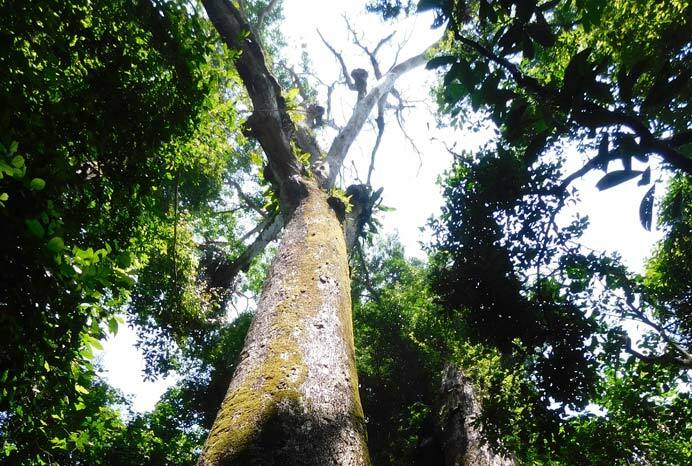 This hike takes you through the secondary and successional forests of the lowlands where the walking is easy and the bird watching and wildlife observation is excellent. 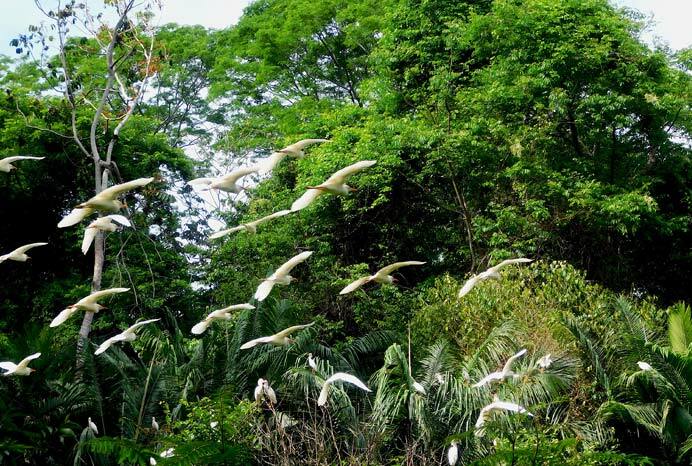 At one point near the mangrove you will have a view of a rookery where several species of water birds nest in the rainy season. Mangrove is a special kind of tree that requires salt water to grow. They are an essential part of the reproduction cycle of many commercially important marine species, and are protected by law. They are also home to a multitude of other species of birds, reptiles, and mammals. Times: 6:00 AM and 3:00 PM, Monday – Saturday. What to bring: Hiking Shoes or Tennis Shoes, Binoculars, Sunblock, Hat, Camera, Water Bottle, Light Clothing and Bug Spray. Some call it a challenge course and others a rope course. Think of is as an obstacle course 33 feet / 10 meters off the ground. 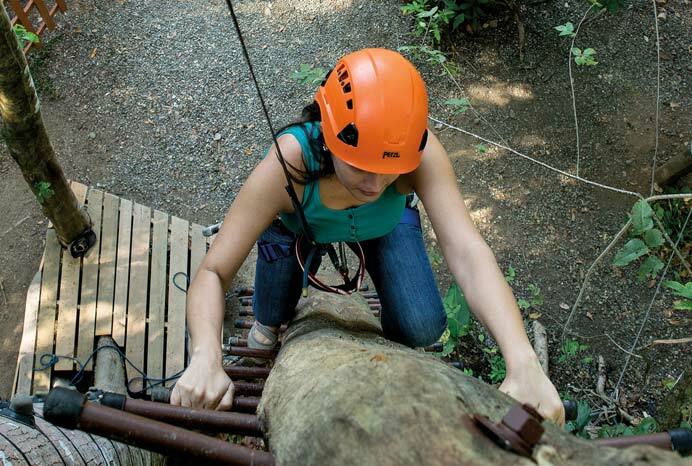 The Monkey Challenge begins with a climb to a platform 6 meters (20 feet) above the ground. 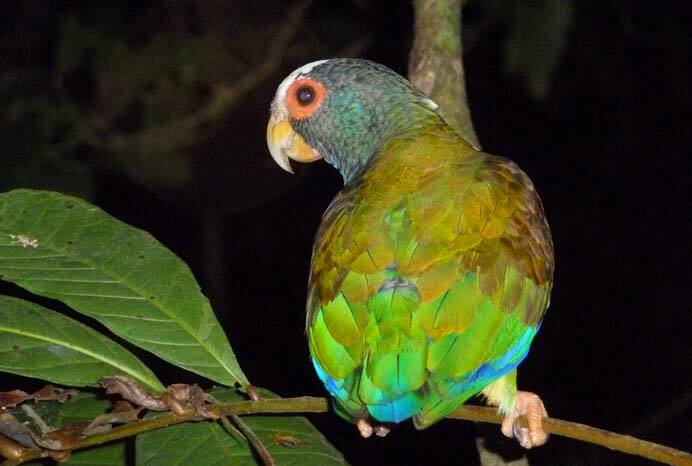 There are two climbing options, hand and foot holds like a climbing wall, or a parrot scale like a ladder. 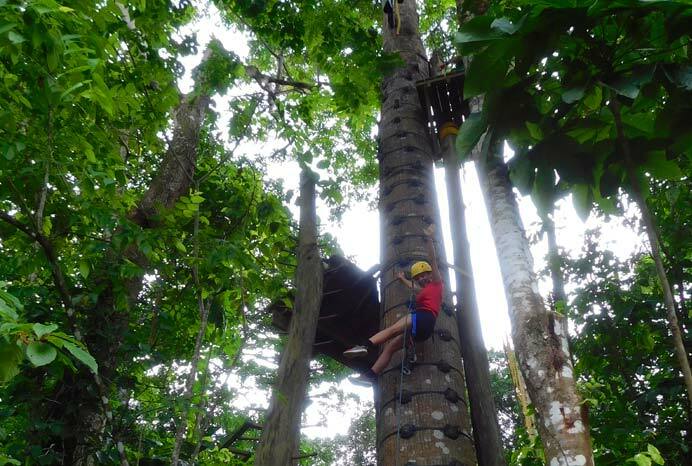 Beginning from that platform you traverse six different elements or bridges of varying difficulty while gradually ascending four meters in the process. 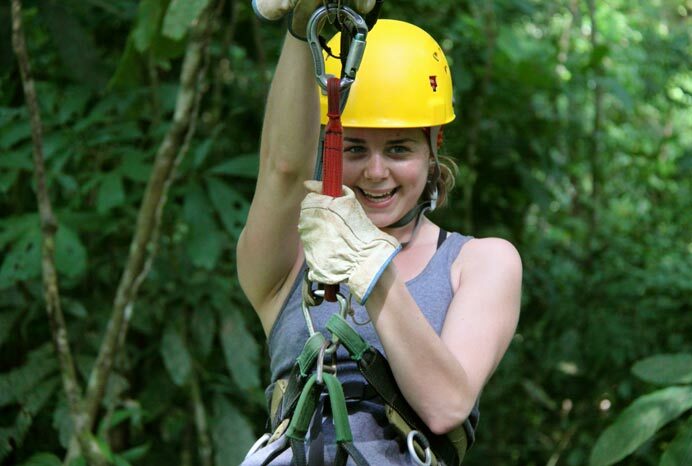 All of this takes place in the canopy of a stand of trees at the Hacienda Baru headquarters. With some luck the monkeys will join you in your endeavor. Upon completion of the final bridge you will arrive at a 10-meter (33 foot) platform from which you must jump, putting your trust in the automatic belay that lets you drop slowly to the ground where it all began. Duration: 5 to 30 minutes depending on your skill and physical condition. Times: 8 AM / 11 AM / 2 PM, Monday – Saturday. Minimum age: 10 years and 1.5 meters (4 feet 11 inches tall). Maximum weight: 114 kilos (250 pounds). What to bring: Hiking Shoes or Tennis Shoes, Sunblock, Camera, Water Bottle, and Bug Spray. What’s included: Guide, and the Medicinal Plant Garden. 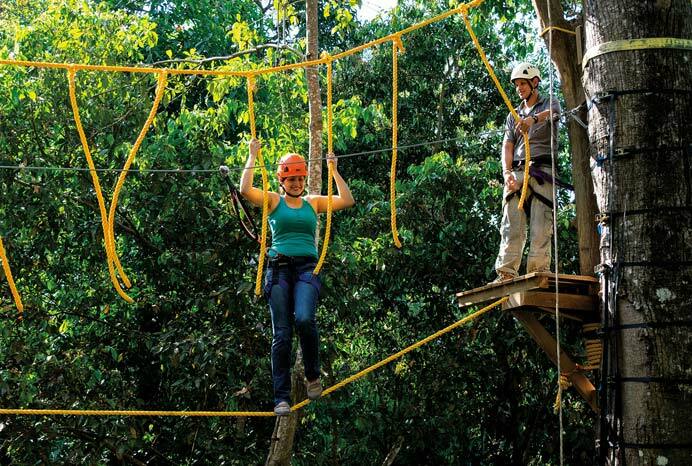 These attractions at Hacienda Barú are free for lodge guests. For outside visitors the rate is $15 per person for the day. The trails are open from daylight to dark. Special permission is needed for nocturnal hiking. 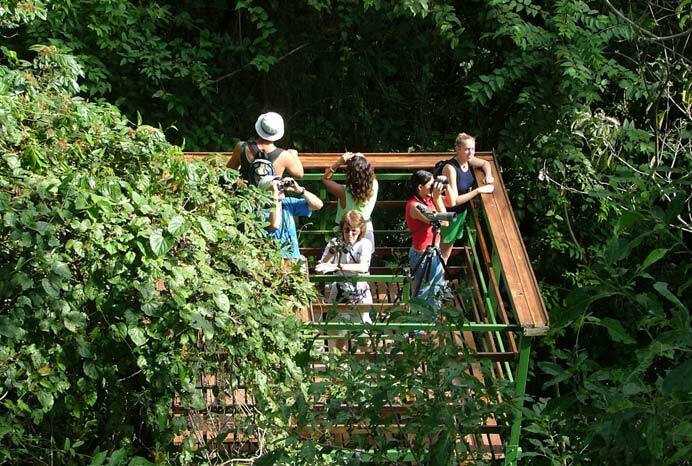 Bird Watching Tower – On top of a small hill sits a seven-meter tower. The combined height of the hill and the tower puts the top floor at tree top level, a perfect place for the observation of birds. For the best birding we recommend visiting the tower before 8:00 AM or after 3:00 PM. 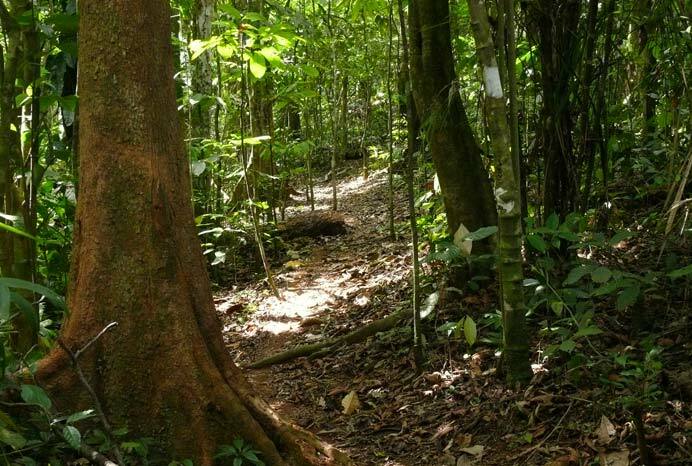 Nature Trails in the Hacienda Barú National Wildlife Refuge – The nature trails at Hacienda Barú pass through many habitats including primary forest, secondary forest, swamp forest, wetlands, pastures and tree plantations. Some of the trails are short and some long. Some go to the beach and some to the mountain. All the trails have informative signs with information about the flora and fauna. Time: 7:00 AM – 5:45 PM, Monday –Sunday. What’s included: Admission Fee to Hacienda Barú National Wildlife Refuge, Bird Watching Tower, and the Medicinal Plant Garden.